Nine Lives Too Many.......The Cat Comes Back! I continue rummaging through the past and low and behold what do I find? 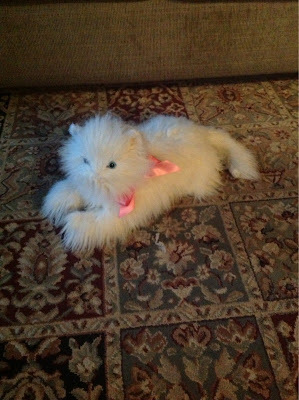 The stuffed cat that my husband bought my daughter the day she was born. Honestly I thought that this little kitty had used up all nine lives but I guess it has one more so here goes. On August 3rd, 1980 "said cat" was brought to the hospital by my husband as a gift to welcome our third child. It was my husband's "thing" to buy each of our children a special stuffed animal to honor the day they were born. Our oldest boy got a huge, and I mean huge, teddy bear, our second boy got a giant gorilla and our daughter got a life size cat. I have to admit when I saw my husband walk through my hospital room door with this furry feline I just about died. (I would have laughed but my stitches were killing me.) It was as big as my baby girl and it had a scary, possessed look on it's face. The most disturbing part though was that when you squeezed it, it vibrated and emitted a sickening purr. But never the less the cat came home with us and held it's place of honor in my daughter's bedroom..... until her older brothers got hold of it that is. 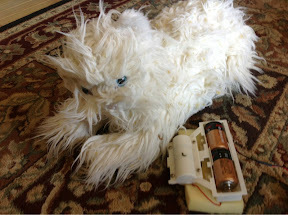 Of course they played too rough with it and before long the motor broke and the fur became dirty and matted. Even some of the seams gave way spilling out tiny pieces of yellow foam. Our own pets would whimper and growl in it's presence. When small children came to visit they too were scared of it forcing me to hide the cat out of sight. Sick and tired but with every intention of repairing it in time, I tossed it behind the cellar stairs and immediately forgot about it.....Yes, until now that is. Honestly, is there no end to the yarn stash that appears to be growing by the minute in my spare room closet. Even though some of the original projects now elude me I'll continue my quest to use up all of the yarn that I have acquired. Here is another headband made with a skein of (pre-grandson) pink yarn that I bought. This headband is crocheted. It has been a while since I've done any crocheting. It isn't hard; I guess I just prefer knitting. My grandmother taught me how to crochet when I was young. She always crocheted such beautiful things. 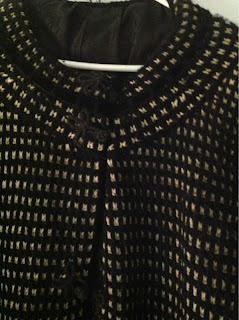 She even crocheted a gorgeous black and white wool coat to wear to my sister Cheryl's November 14th 1970 wedding. I wish I had a picture of my grandmother wearing it but I don't. 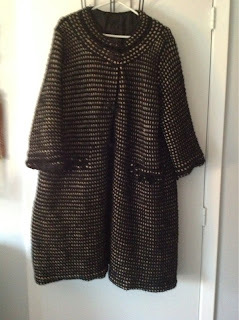 I do however have the coat (Of course I saved it, that's the reason I'm in the mess I am in, I can't let go of the past. I wonder what Dr. Phil would have to say about that? hmmm....) Anyway she was an amazing woman. 53 degrees....wow not bad for January 12th right? Hopefully we'll go all the way to Spring with this kind of weather. Heads Up......Your Hat Is In The Mail! 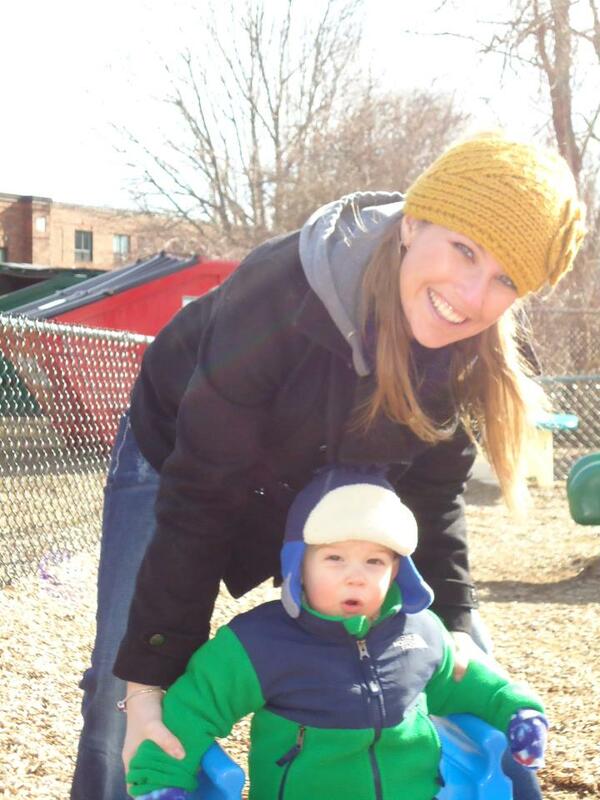 A year ago last October I went to a Harvest Fair in New Hampshire with my daughter. While perusing the little craft booths we came upon a woman selling knitted winter hats and headbands. They were unique and quite lovely. We stopped and tried them on. I quickly settled on a mustard colored headband that I liked. It isn't often I find a hat that looks good on me. My daughter Meagan tried on several and couldn't decide so I confess, in order to hurry her along I told me not to worry that I could easily make one for her within the next few days if she just told me the color. She decided on black. (Ok, I know what you're all thinking. Meagan of all people should know I can't keep a promise when it comes to finishing anything so why did she fall for that line right? Well she did.) Once home from New Hampshire I actually bought the yarn and the pattern. My intention was to make the headband for her for Christmas 2011. When that didn't happen I promised it again for 2012. Nada! I have no excuse that you haven't heard before but if it helps I do feel bad. Every now and then my daughter would ask about my progress and I easily changed the subject. Thankfully she stopped asking. Sometimes when she visits she borrows my headband leaving me hatless; that's OK with me as it helps ease my guilt. Yesterday, Lo and Behold, I found the time and inclination to finally make my daughter the coveted headband. All in all I am happy with the results and just to make sure she gets it before winter is over I packed it up and gave it to my husband. (who by the way finishes everything he starts) He took it to the post office.